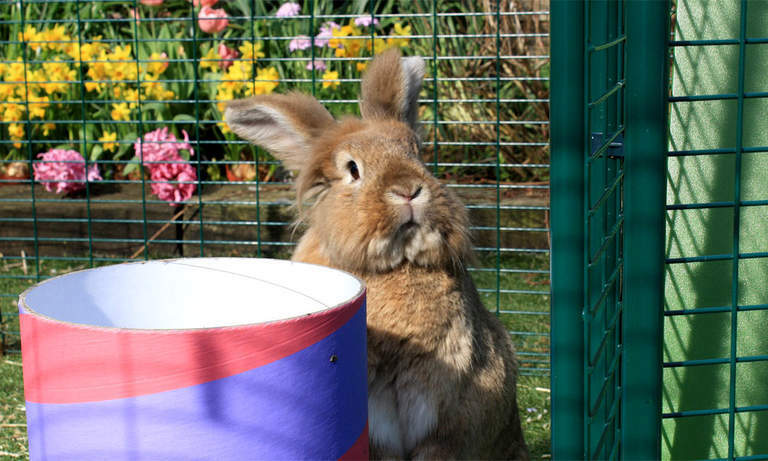 Rabbits love to run, hop and jump, so it's important that you provide your pets with enough space to play in every day. 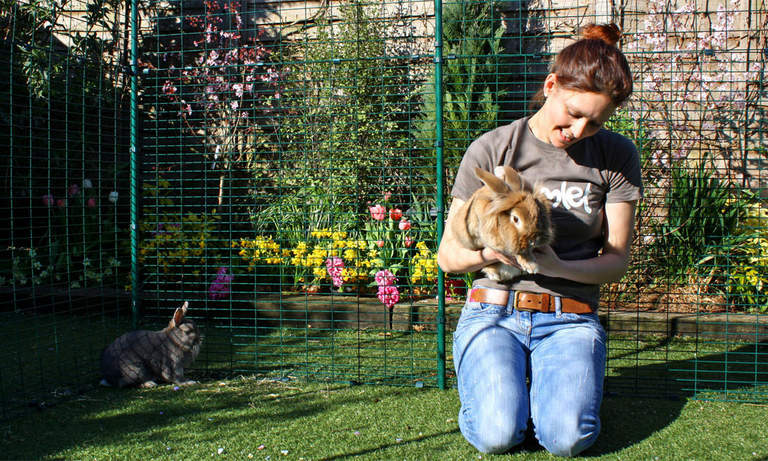 This Outdoor Rabbit Run is just the thing. 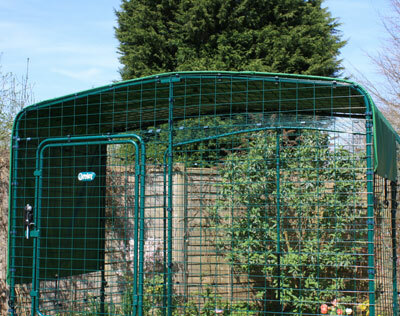 Unlike other metal rabbit runs, this has been designed to blend into the garden, so it won't be an eyesore and it will keep your rabbits safe from predators and other pets. 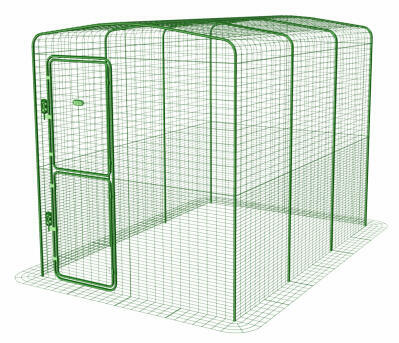 This secure rabbit enclosure is extendable in width, length and height, making it suitable for every breed of rabbit, from Dwarf Lops to Lionheads to Flemish Giants. 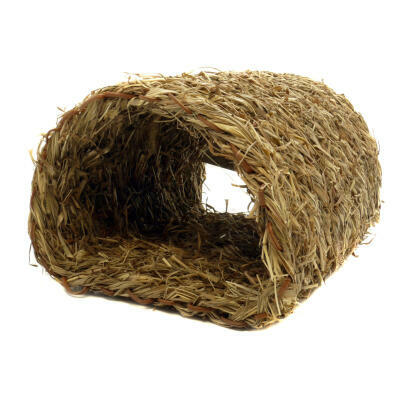 Attach this rabbit run to your Eglu Go Rabbit Hutch, place your wooden rabbit hutch inside or simply use as a separate play area for a few hours a day. 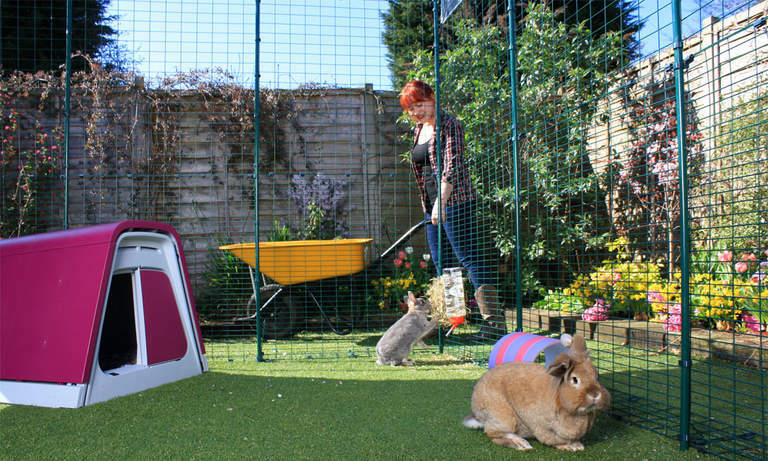 However you choose to design your rabbit keeping area, this run will give your pets lots of space for exercise. 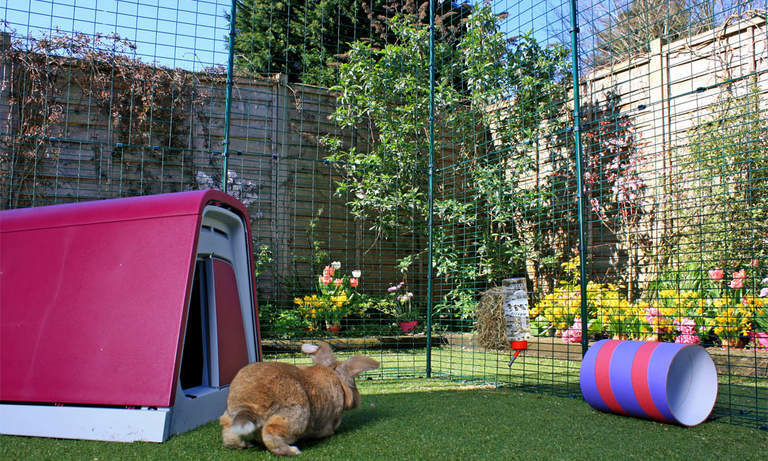 Bunnies will love spending time in this spacious outdoor rabbit run, while you can go about your daily chores. 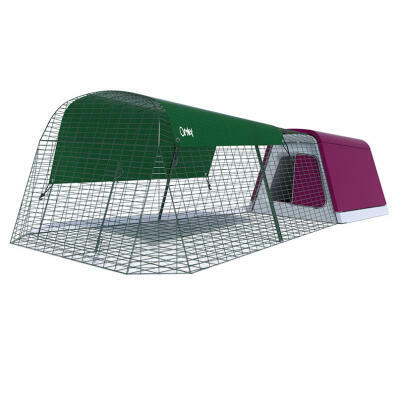 The Outdoor Rabbit Run is suitable for every rabbit breed and size. 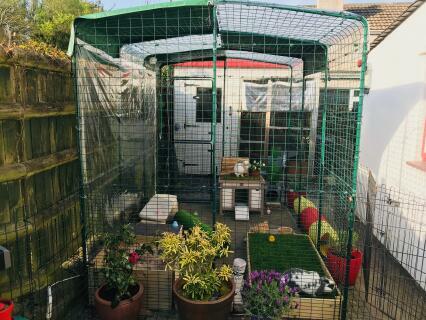 The lo-rise rabbit run offers lots of floor space for your pet bunnies. 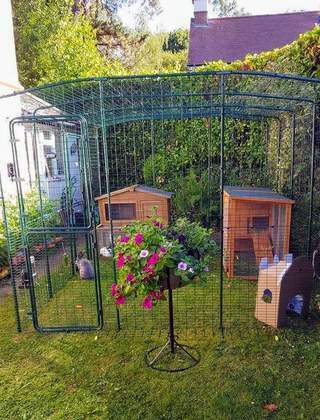 Placing a rabbit hutch in the outdoor rabbit run will give your pet bunnies somewhere private to shelter. 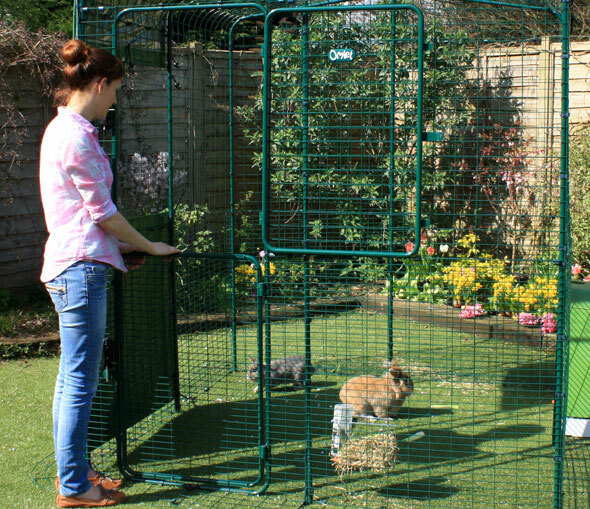 The hi-rise rabbit enclosure is high enough for you to stand in, with lots of room to sit and play with your pets. 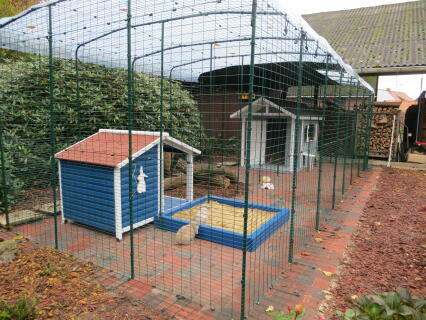 Rabbits will love hopping around the large outdoor run enclosure. 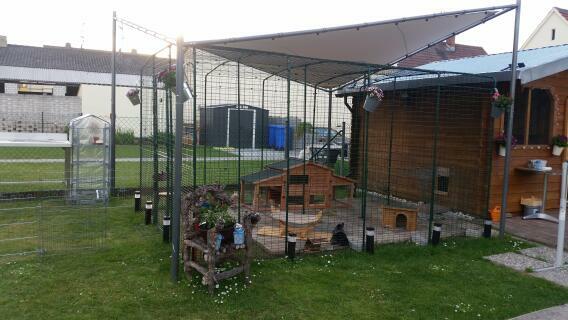 There's plenty of space in the Outdoor Rabbit Run for you to go inside and interact with your pets. 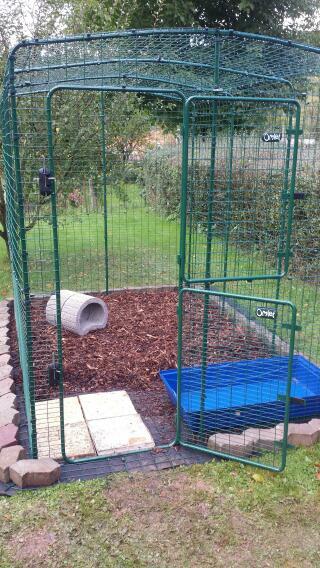 The Outdoor Rabbit Run is available in two heights. The Hi-Rise version allows you to literally walk straight in. 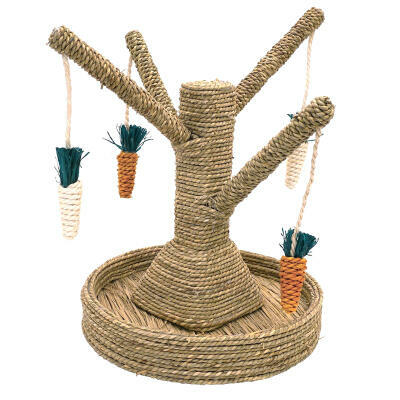 You can then spend more time hopping about with your pet rabbits, tidying the run and topping up their hay rack and water bottle, all with the greatest of ease. 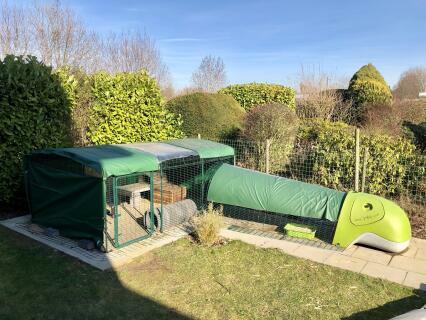 The Lo-Rise version is a spacious rabbit run, giving your bunnies a large floor area, at a lower height and a lower price (of course if you are less than 1.16m tall you can still walk in). 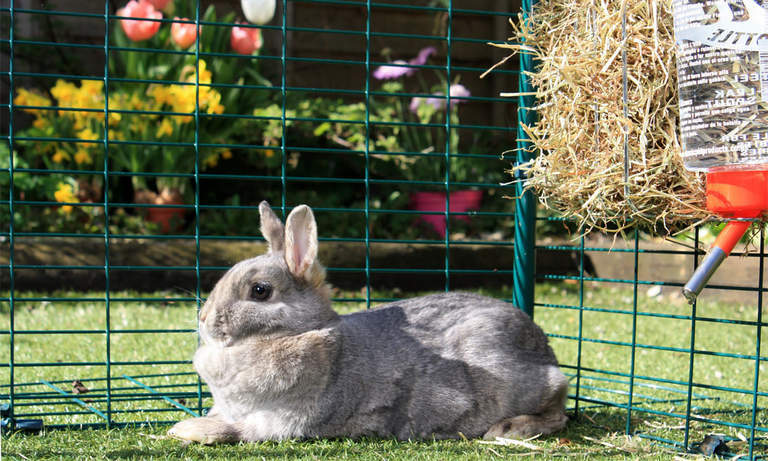 Both sizes of run are suitable for the smallest, such as Mini Rex, to the largest, such as Giant Angora, breeds of rabbit. 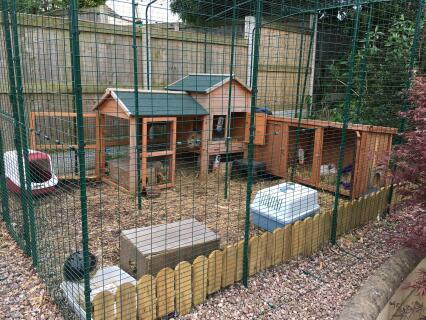 The Lo-Rise Outdoor Rabbit Run has plenty of floor space and the height can be extended at a later date. 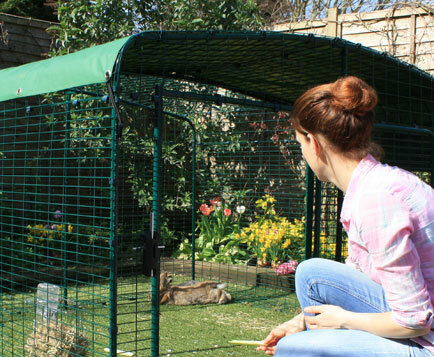 The Hi-Rise Outdoor Rabbit Run allows you to walk in to spend time with your pet bunnies. 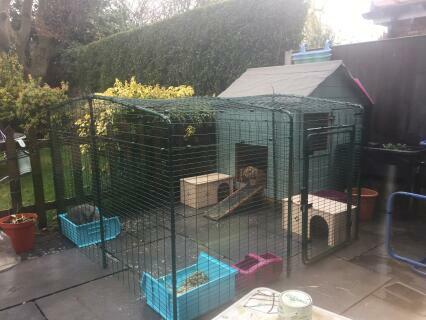 The Hi-Rise Outdoor Rabbit Run has a full height stable door making it easy to throw in some treats. 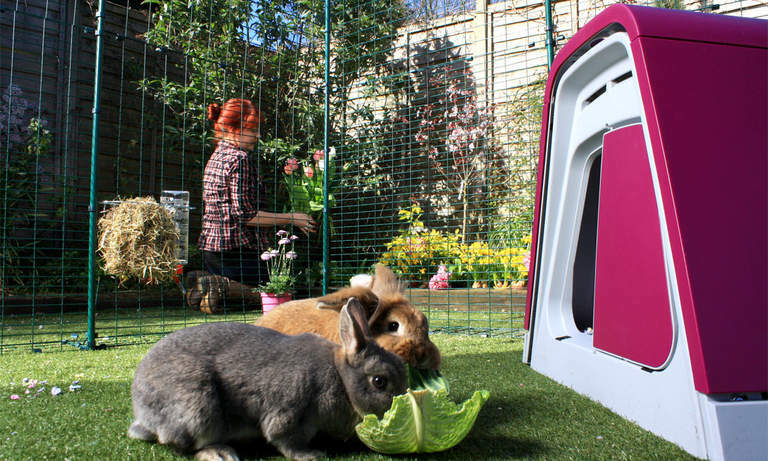 If you opt for the Hi-Rise Outdoor Rabbit Run, you’ll have the benefit of a stable style door. 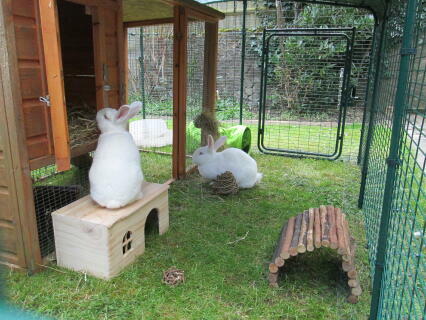 The top and bottom of the door open independently allowing you to throw in some healthy treats for you rabbits without them hopping out to explore the rest of the garden. 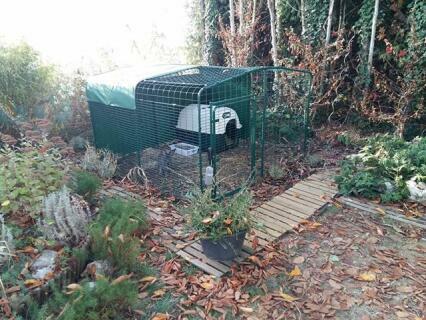 Extra doors can be purchased and added to the rabbit run in various positions too. 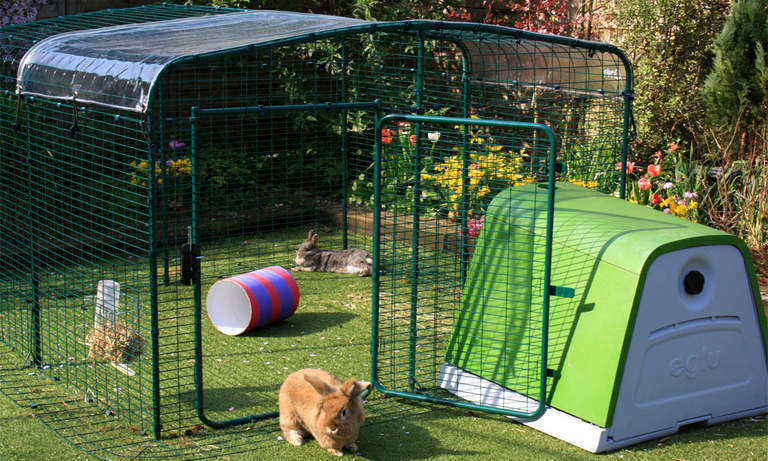 The Lo-Rise version of this outdoor rabbit enclosure still has a large door which is easy to reach through and top up your bunny's hay rack and water bottle. Children will find it easy to crawl in and sit with their pets too. 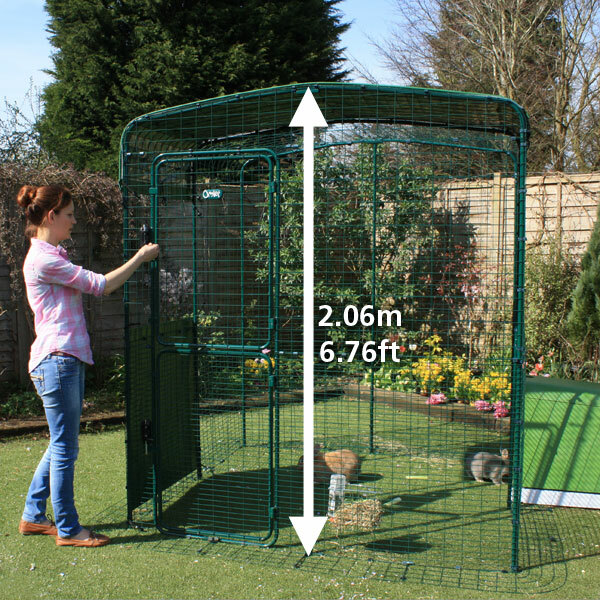 The Lo-Rise Outdoor Rabbit Run has a large door, giving easy access to your pet rabbits. 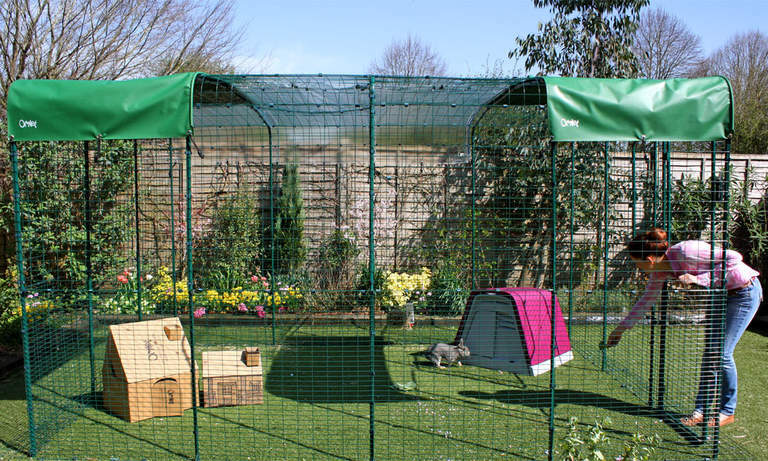 The Outdoor Rabbit Run has been designed to offer your pet bunnies a large outdoor space that looks attractive while keeping your rabbits safe. 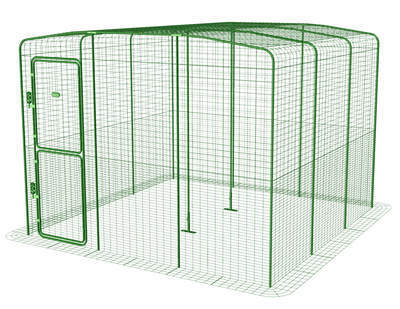 This rabbit run will give you peace of mind that your pets are getting the best care possible. 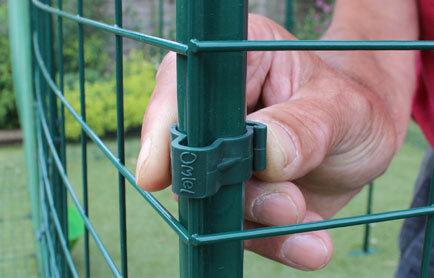 Omlet's experience and reputation for designing products that are great for you and your pets are on show across several key features of the Outdoor Rabbit Run. 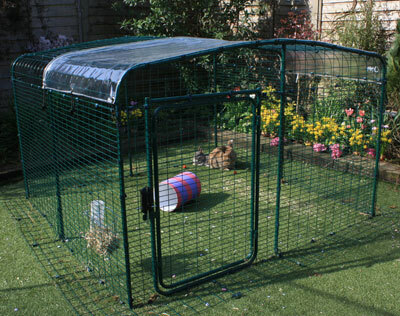 Your pet rabbit will be happy and safe in its Outdoor Rabbit Run. 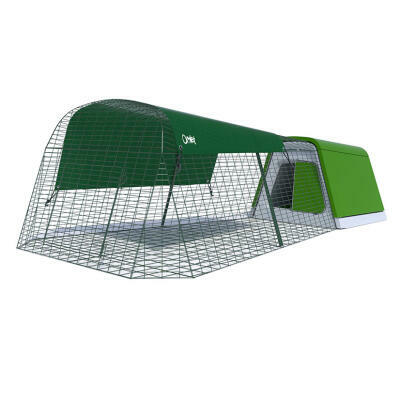 The Outdoor Rabbit Run has a detachable anti-tunnel skirt to prevent predators from digging in. 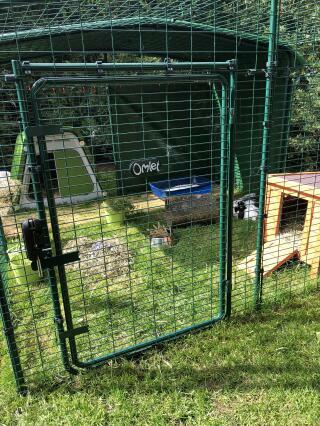 You can lock and unlock the door from inside the Outdoor Rabbit Run. 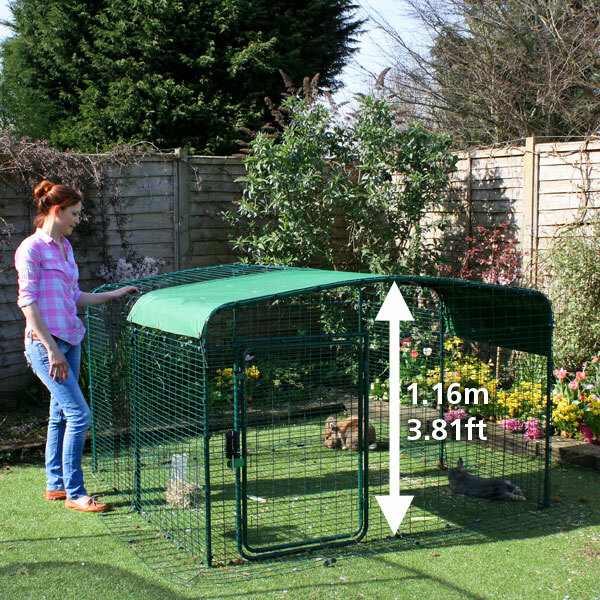 This spacious rabbit run can be extended in numerous ways to give your pet bunnies an even larger area to hop around in. 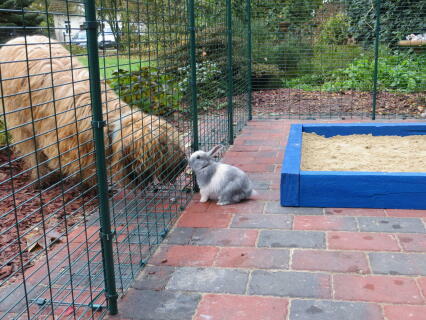 You can choose to buy a rabbit run as large as you like immediately, or extend it over the years. 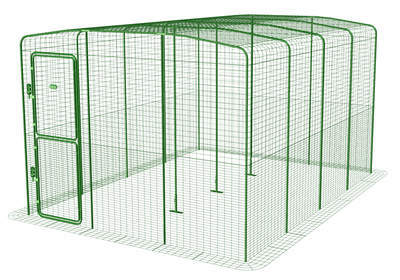 Increase the width, length and height, using easy to add sections, and create a custom made rabbit run to suit your requirements. 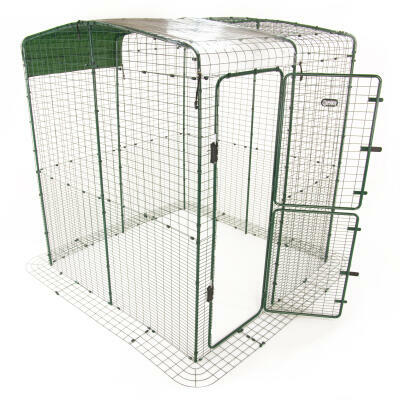 Please refer to the Outdoor Rabbit Run Configurator for options on how to extend your run. 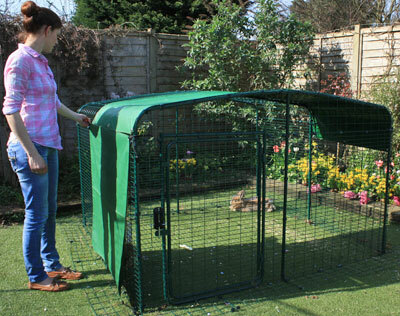 An extended 3x4x2 Outdoor Rabbit Run will give your pet rabbits lots of space to hop around in. 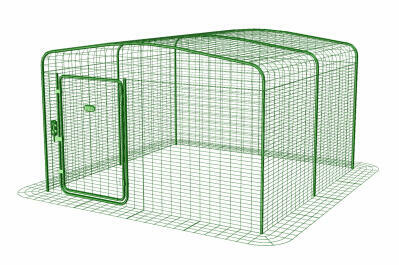 Accessorise your Outdoor Rabbit Run with a Heavy Duty or Clear Cover in different sizes. 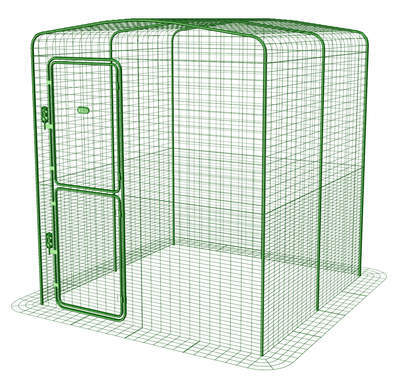 These can be used independently or in multiples to create sheltered areas for your pet rabbits. 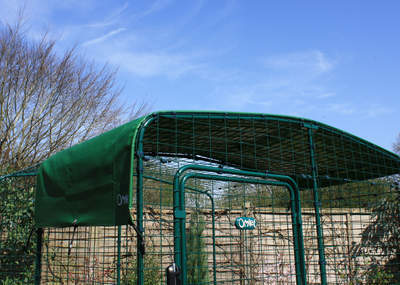 Omlet Covers are extremely hard-wearing and they will provide brilliant protection against wind, rain and snow. 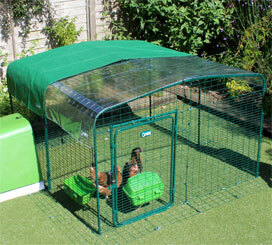 The clear covers are ideal for winter and the heavy duty covers provide lots of shade in the summer. 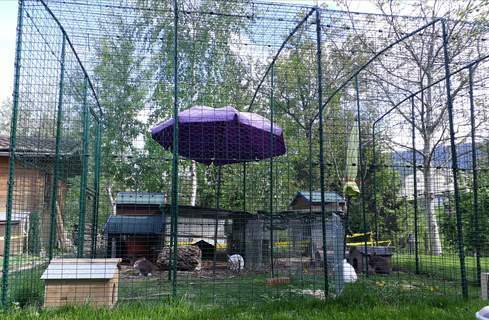 Your bunnies will be sheltered in their enclosure with a Heavy Duty Roof Cover. 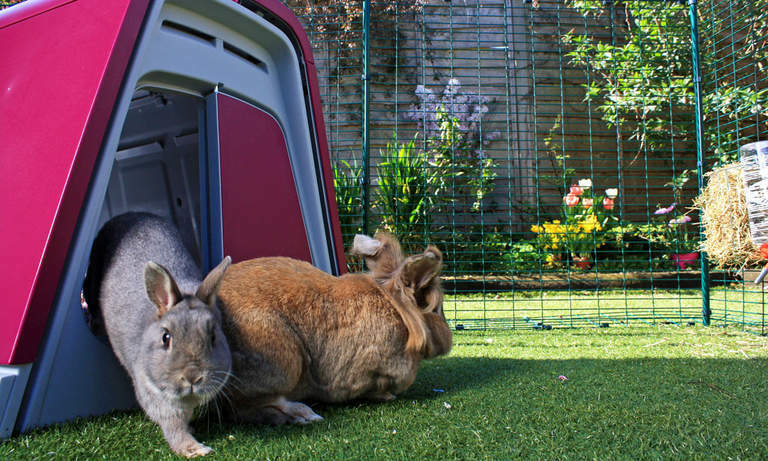 A Clear Cover for your run roof will keep pet rabbits dry whilst letting in sunlight. 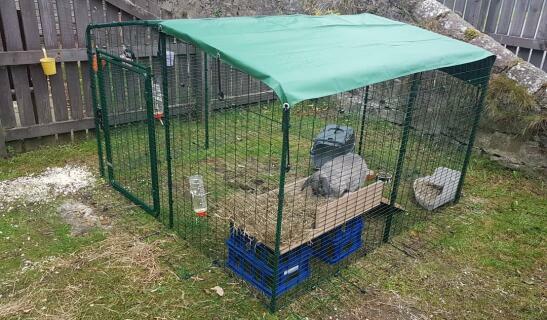 Combine several Covers to keep your rabbits sheltered from wind and rain. 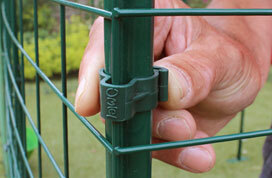 Assembling your Outdoor Rabbit Run is quicker and easier than ever. 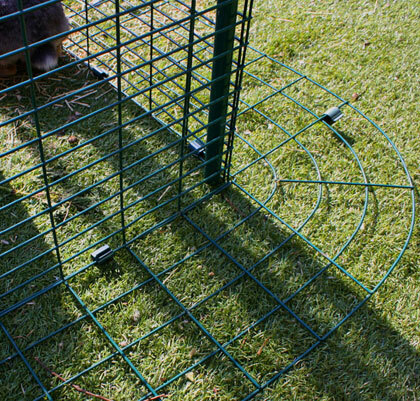 You can assemble a Lo-Rise rabbit pen in around an hour and a Hi-Rise version should take you no more than one and a half hours to assemble, using the simple instructions included. The only tool you will need is a pozi (cross type) srewdriver, for the Door Bolt. 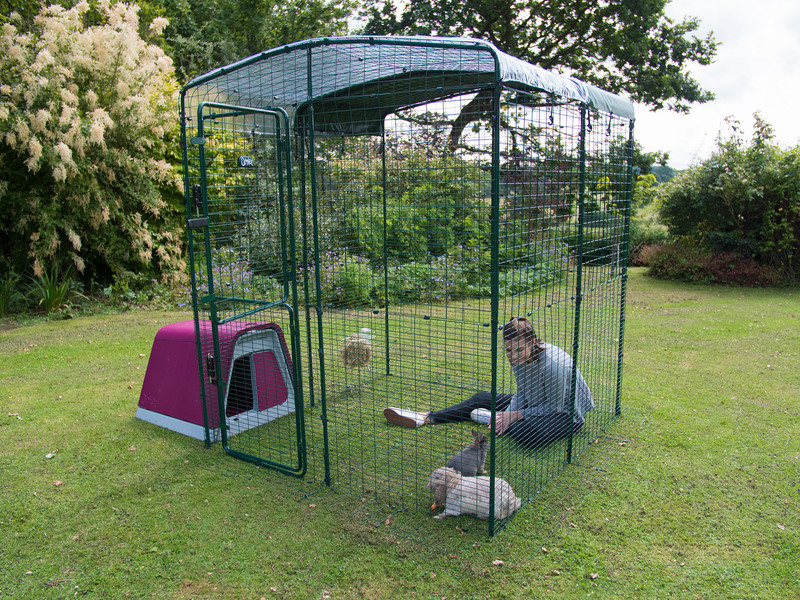 The Outdoor Rabbit Run has been designed to work with your existing Eglu Go or Classic Rabbit Hutch, so you can create a custom rabbit keeping area to suit your garden. 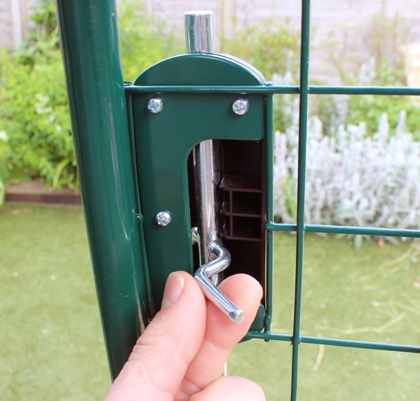 Use a Connection Kit to attach your Eglu rabbit house directly to the rabbit enclosure, or simply place your existing hutch inside the run. 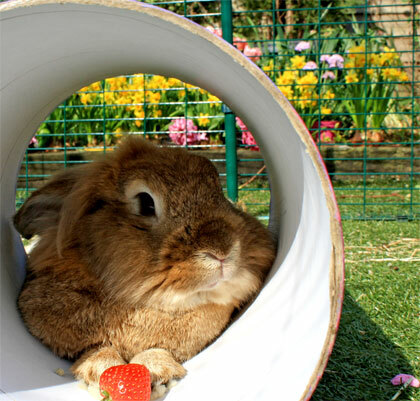 Your pet bunnies will love having somewhere to eat, rest and shelter in their new rabbit run, whether that be a hutch or a cardboard box. It is a good product, worth the money. 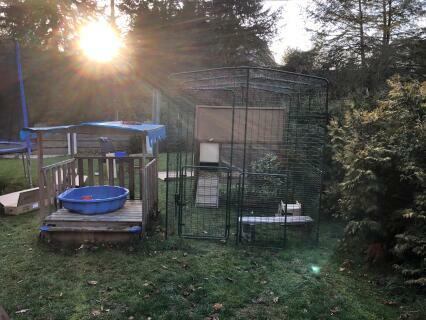 Before buying this rabbit run, we bought a less expensive run and a hatch. 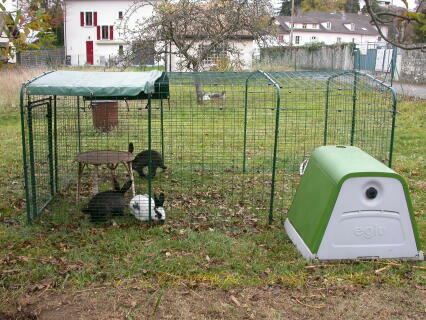 But the cheaper options gave us enormous stress because of difficult assembling and our rabbits ran away many times from the hatch and we & our neighbors needed to catch them. 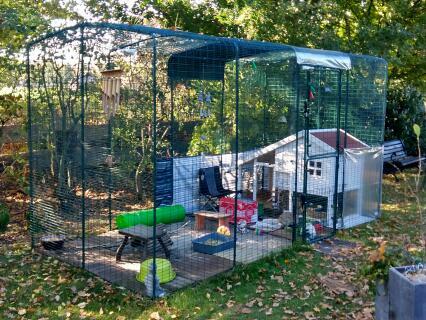 So we decided to buy an Omlet run and an Eglu Go hatch to attach to the run. 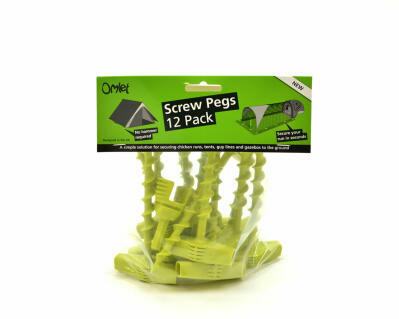 It’s not cheap, but trust us, worth the money!! 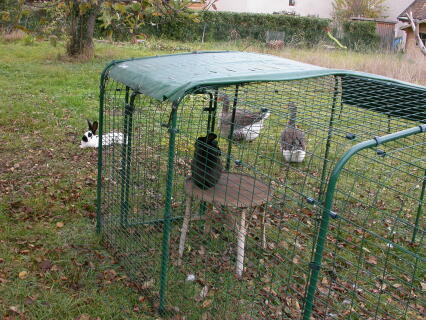 We are now free of the stress to catch the runaway rabbits and most of all, our rabbits seem happy. Kids can play with the rabbits in the run. At night, we lock the rabbits in the hatch so they are safe. 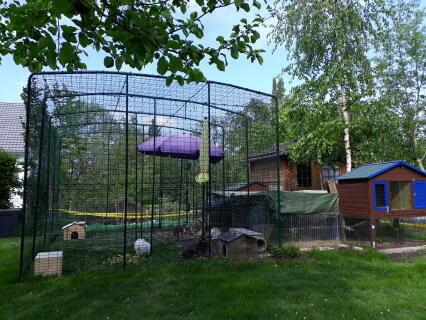 I love the omlet 2x2x2 rabbit run. 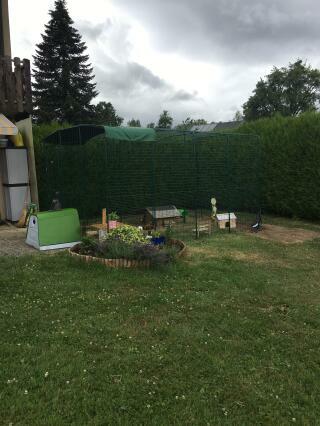 I have 3 rabbits (all female) and I am able to leave their hutch door open and let them run freely without fear of any critters getting to them or them escaping. Also, I like that my grandkids and I can get in the pen and play with them. 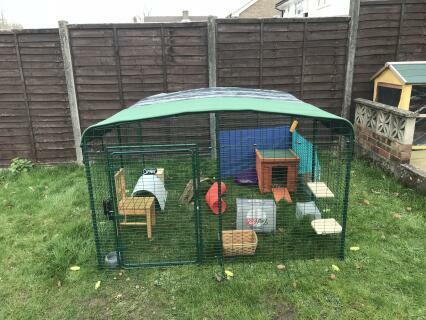 We decided to purchase a 3X3X2 run for our 3 rabbits from Omlet as they had stock available and the run appeared to fit our needs. As the main 'carer' I need a full height run to go into to clean, feed , water etc. Assembling the run was pretty fiddly and time consuming, but once you figure out how to identify the parts and the best way to put them together you get quicker. The instructions could be clearer - more step-by-step, would be useful. I managed to assemble it pretty much on my own, which obviously takes longer, but its worth it in the end. 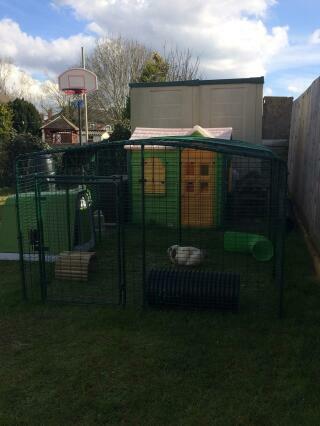 Our rabbits seem to be very happy in the run, with loads of space to run around in. Our child loves it as they can go in without an adult and feed and interact whenever they want. Whilst the steel mesh is of a thick gauge I'm not sure how strong the run is overall to an attack by foxes as the panels are clipped together with plastic clips - so i have started to add cable ties to 'weak' area's and will be installing an electronic fox deterrent too. 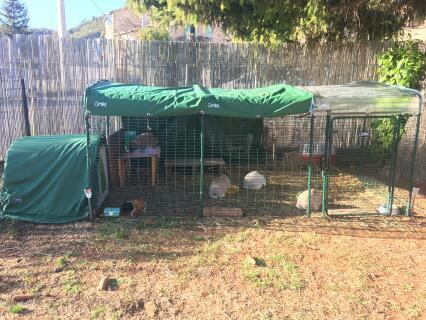 Day to day the run is easy to use and gives the rabbits the space they need and we spend quite a bit of time just sitting and watching them play - which is really nice for all of us! We have bought the run in two packages. Our first purchase was for the basic 'low rise kit' which does the job well, but for the back pain sufferers out there, we would recommend you go for the 'high rise model instead. You'll be glad of it. 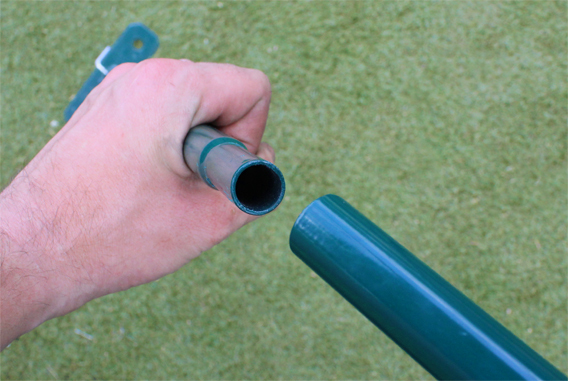 We soon learned this for ourselves and we bought the upward extension and boy, does this make a difference.